Looking to build a pool? This guide will help you cover all bases! If you are looking to increase property value, recreate the villa vibes of your last Bali holiday, or simply like the idea of lounging in a private outdoor pool each weekend, then building a concrete pool could be right up your alley. Building an in-ground pool is no easy task though, they can take months to build and require a solid amount of research and planning. This applies to any in-ground pool style, including infinity pools, lap pools, splash pools, dive pools, and even ‘man-made’ plunge pools with resistance jets. With all this in mind, we’ve compiled a step-by-side guide, along with a few tricks and tips to help you visualise and plan out your big pool project! Before we break down the project steps, one of the key factors to be aware of with building a pool is knowing what’s underneath your project site. This means going out and locating any and all utilities, rock masses, or even water wells that may be hidden under your yard. You’ll need to be sure that you can actually dig and build a pool in your yard before contacting an architect and drafting plans, with steps taking place before digging commences. Skipping this step could prove detrimental to your project and the safety of your workers. Furthermore, taking the time to do this now will save you a LOT of money in the long run. You may find shallow utility lines or even sewage pipes prohibiting swimming pool construction, at least in some parts of your yard. Just as with buying a new car, the research stage is critical, not only in regard to getting a good quote but also in terms of the delivery quality and project outcome. Take the time to read swimming pool builder reviews, ask questions, and gauge the experience of any builders you are considering to hire (iSeekplant’s search functionality will be a massive help here! We recommend running a search for a small excavator). Don’t be afraid to ask for information and images of their previous projects. Don’t settle for the first company you find, compare everything from costs to pool construction time estimates. What are the steps to build a pool? Get a rough quote and ensure you have the funds to follow through with your in-ground concrete pool, ensure you have excess funds to cover any unexpected costs. Critically evaluate your yard and ensure that any utilities and pipes are identified. Don’t rely on outdated plans. The best way to find this information is to contact Dial Before You Dig, an accredited not-for-profit safety initiative that assists builders and homeowners across Australia in identifying underground utility lines that may be in the way of a planned excavation. This stage will see you contact builders and an architect, draft up plans, and acquire a collection of quotes from around town. It’s critical to compare and contrast both service history and price quotes between suppliers. Ask for examples of past work and read through customer reviews. This stage is where you choose and engage with a builder, finalise plans, get a final quote, and gain council approval for your plans to begin pool construction. While planning approval by the council isn’t needed, you must acquire building approval and sewerage/water supply approval from them. For most councils approval is given via a building certifier who will assess whether your proposed project complies with the Building Act 1975 and associated standards. In Australia, your contracted builder will typically engage and organise with certifiers directly on your behalf. 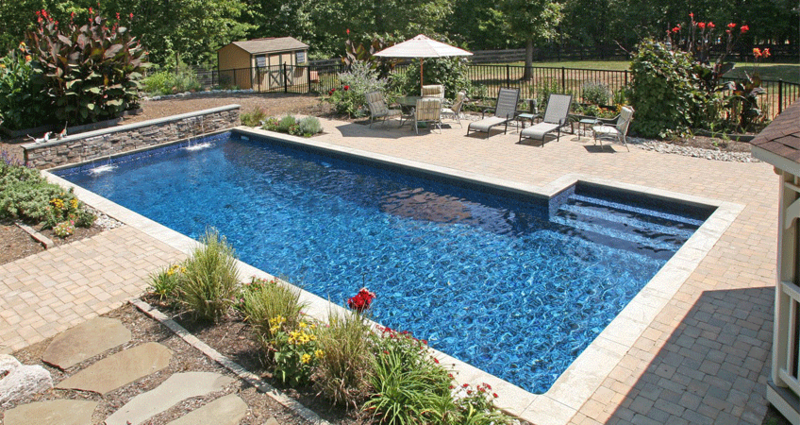 From here, professional pool builders typically take over, as you typically need a qualified builder or project manager, excavator operator, a plumber and an a electrician to process designs, gain council approval, organise supplies, excavate, lay plumbing work, manage labour, and construct the pool. With the help of an excavator, typically a 5-6 tonne machine, professional contractors (wet hire) or yourself (dry hire) will excavate the pool hole. 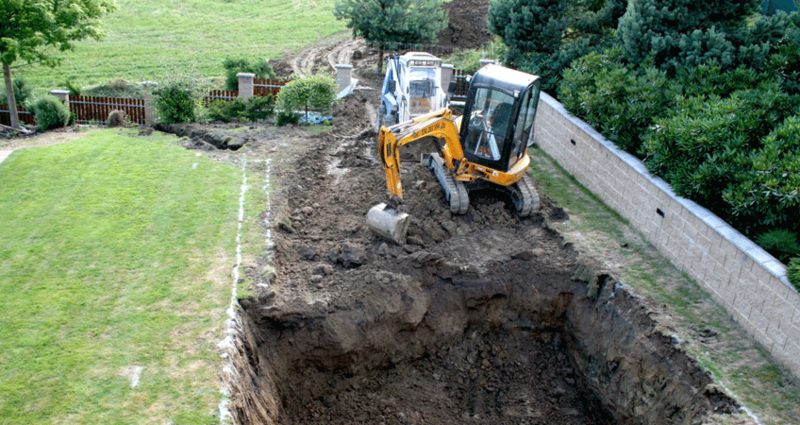 To excavate the pool hole, an operator will utilise a skid steer or track mounted excavator, along with shovels, rakes, a pick axe, sledgehammer, and a wheelbarrow. Soil type and conditions are important to note here, as excavation on sandy or easily erodible soil may demand the specific use of a track mounted excavator. It’s also important to note that you are required by law to have temporary fencing installed around the swimming pool excavation site while digging. Unless you are a qualified excavator operator you’ll need to utilise wet hire rather than dry hire. Wet hire means hiring a machine with a professional operator while dry means you are simply hiring a machine by itself. Click here for more information on the difference between wet and dry hire. At this stage, the excavated soil can be either disposed of or reused, depending on the volume of soil you may need to hire a removalist. Depending on your soil type you may need to add a layer of subsoil, typically compacted gravel. Your builders will typically have a solution, however if not – you can always find a removalist through the iSeekplant directory. From here bars are laid along the pool floor and sides to create a frame of the pool. These layered bars act as the core infrastructure of the in-ground pool, facilitating long-term strength and durability, and will later be covered in concrete. You can think of this step as ‘installing the bones of the pool’. This includes the installation of ancillary pipework, filtration pipes, pool light cabling, a hydro-static valve (for water pressure management), as well as infrastructure for spa jets and pool heating systems. 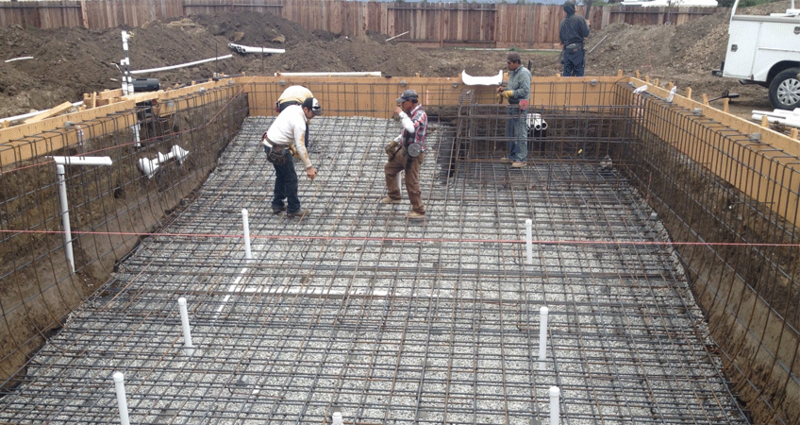 Pipework and tubing is installed before concrete is poured and kept inactive until the pool is filled and systems are activated. One of the most important stages in the pool building process is pouring the concrete that act as the body of your pool. 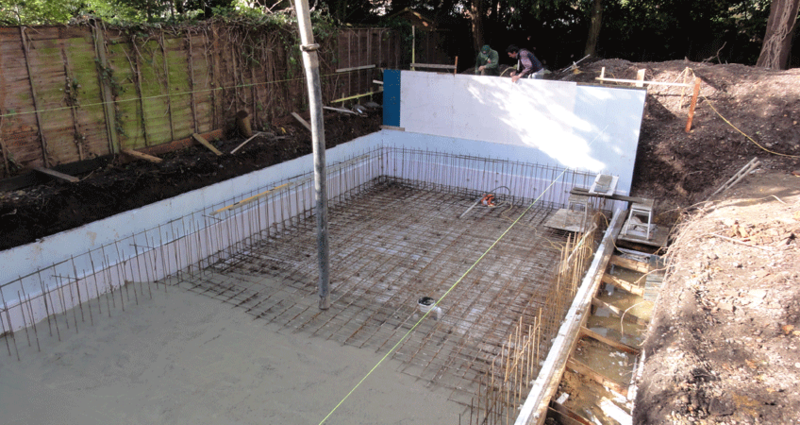 Concrete or a special cement mixture is applied throughout the inside of the swimming pool, covering all the steel bars laid and installed in step 6. This process will take a few days, though this can be mitigated with sealing, where the concrete needs to be watered daily as the concrete cures. Concrete suppliers will normally need to be hired separately, you can do a search for them on iSeekplant here. This stage should not be missed! Step 10 relates to laying down a plaster coat over the concrete layer. Pool plaster acts as a watertight seal while smoothing out the inside of the pool, mitigating the rough texture of the concrete layer. If tiles are being used, they are typically added at this stage around the pool. Filling your pool won’t be a quick task, it’ll require a patient 24 hours or more to fill your pool depending on the size. Don’t be alarmed if the water is murky at first as this is a common occurrence when filling your pool for the first time - the water will clear up once the pool’s cleaning agents kick in via the pool system (chlorine). The second last stage involves checking for leaks or any malfunctions and repair them before finally taking your first swim. This stage isn’t always necessary overseas, however, you’ll find that in Australia there is a safety requirement to maintain a lockable fence around your pool, one that can’t be easy opened by a child. By law, swimming pool gates must only open outward and must close and latch automatically. There is a long history behind this rule, with it becoming law in 1991, where since then the rule has helped prevent thousands of residential pool drownings across Australia. Step 15: Enjoy a swim! Once your pool system has been running for a couple days, with the water looking clear, it’s time for the final step! Slap on some sunscreen, pop on your budgie smugglers, and take a dip in your brand new pool! What types of pools are there? There are a variety of pool types to choose from when building a pool. 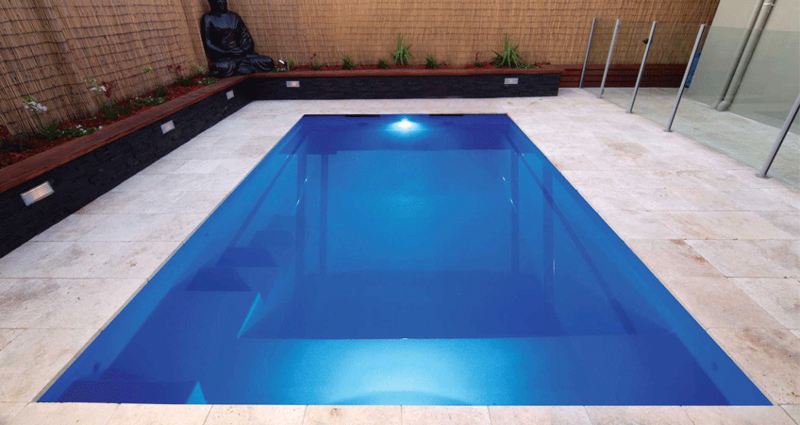 While the most common type in Australia is the in-ground concrete pool you can also find prefabricated pools, clark pools, pools made with pool shells, and fibreglass pools. Additionally, there are also a variety of styles when it comes to pools, referring to different pool shapes and depth levels. Various pool styles include infinity pools, lap pools, splash pools, dive pools, spa pools, and even swimming pools with slides. Furthermore, pools can either be either salt water based or chlorine based, with chlorine pools typically being the easier and more popular option across Australia. What machinery is used to dig a pool? Excavators are a critical component in building a pool, unless you’re game to dig by hand. A typical pool project will see the use of either a track mounted digger, mini excavator, or a wheel mounted excavator, in the size range of 5 to 6 tonnes for residential projects. If the pool is being built in an area currently covered in foliage or bush, land clearing services will be required to clear the land. Pool machinery and services can be easy to source through our directory, with many suppliers also able to provide wet hire (a machine plus an operator), where a supplier provides a professional to operate the machine, and even services like land clearing, mulching, concrete pouring and more. How much does it cost to dig a pool? Excavation for an in-ground swimming pool can cost anywhere from a few hundred dollars to a thousand or two depending on the size of the dig, while covering tip fees and labour costs. An in-ground concrete pool in Australia typically costs upwards of $20,000, depending on the size, scale, hired labour, and type of materials used. More affordable pools are available, however these are typically small plunge pools and spa pools, or module pools, that don’t offer the same size, aesthetic or integrated design. Additionally, costs can be cut or drawn out depending on the type of material used and the specific style of pool being built. Because of the sheer variety of pool builds, it’s important to obtain and compare a handful of quotes from different builders and suppliers to ensure you get the best value and service quality for your project. Additionally, extra costs for things like pool automation can be up to $3500, while automatic pool cleaners (like a Kreepy Krauly) can cost anywhere from $300 to a few thousand dollars, the inclusion of a feature wall could cost up to $4000, with pool heating systems fetching a price tag of up to $3000. As these are only rough estimates considering the sheer variety of pools out there, it’s best to source tailored quotes for your pool project to get a more accurate prediction of cost. Can you build a pool yourself? A swimming pool is the sort of project that typically needs to be done professionally, contracted out, at least partially - unless of course you and/or your partner are experienced tradies, have an excavator licence, plumbing and electrical qualifications, and valid permits. 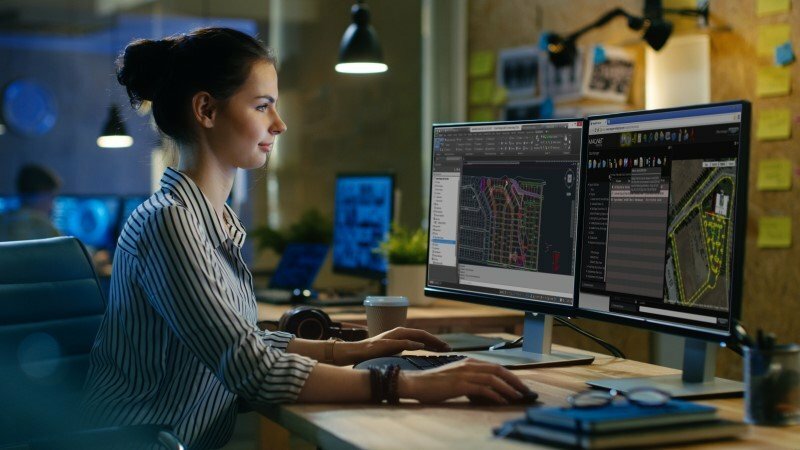 You can act as the project manager for your pool project and simply outsource each stage of the build - this is a popular option amongst ex-project managers and engineers. While complete DIY might be tricky, partial DIY is very much possible - these DIY legends do exist! Even if you aren’t a fully-fledged tradie, you can still oversee the management of your project by using a combination of suppliers and contractors, you just need the time and management skills to match. However generally speaking, the general Australian population don’t have such skills and need to seek out professionals to help them both project manage and build their pool project. One of the common lures of DIY projects is the promise of saving money. However, when it comes to Australian pool projects, even if you outsource everything you may not save that much money when taking into account the cost of your own time/labour or the cost of mistakes and unforeseen delays. There is no doubt though that there are people out there with enough project management experience or industry know-how to tackle a DIY pool, but they are the few amongst the many. If you have the qualifications and experience then tackling a DIY pool with dry hire could be the way to go. Dry hire is best suited for those with proven skill and experience with particular machines and jobs, whilst wet hire is best for those who are inexperienced or want total security in the knowledge that the job will be done well, on time and with optimal safety. If you contract a builder they’ll deliver wet hire, this would mean your project would use an excavator with a dedicated operator. In light of this, our directory is chockablock full of suppliers, machines, and services to help you with your newest residential or commercial challenge. From land clearing and excavation to concrete pouring, iSeekplant has your pool project covered! Should I hire a contractor to build my pool, or can I do it myself? In light of this, our directory is chockablock full of suppliers, machines, and services to help you with your newest residential or commercial challenge. From land clearing and excavation to concrete pouring, iSeekplant has your outdoor pool project covered! Click here to find and compare suppliers that can help with your pool project!